The first reggae performer to achieve a world-wide audience -- as well as being a significant cultural figure -- Robert Nesta Marley was born in Nine Miles, a small village located in the north Jamaican parish of St. Ann. His father Norval Marley was Jamaican-born but of British decent, having returned to the island following several decades of service in the British Army and married Cedella Booker, an 18-year old native Jamaican woman. Bob's father provided financial support for his family, but had a minimal presence in his son's life as a result of his frequent traveling; this support ended in 1955, however, when Norval died of a heart attack, forcing Bob and his mother to relocate from rural Nine Miles to the dangerous Trench Town slums of Kingston. It was here that he became active in music, inspired both by American R&B and the unique styles developing in Kingston. At the age of 14 Marley left school to work as a welder's apprentice, while also pursuing his musical interests with friend Neville "Bunny" Livingston (later to be known as Bunny Wailer) and an older Rastafarian singer named Joe Higgs. Sessions with Higgs provided an introduction to fellow aspiring singer Winston "Peter" McIntosh (who subsequently shortened his name to just Peter Tosh), who would complete the collaborative trio within which Marley and Livingston would operate until the mid-1970s. In 1962 Marley recorded his first two singles Judge Not and One Cup of Coffee with producer/Beverly's Records founder Leslie Kong, and although neither song (the latter released under the Kong-invented pseudonym "Bobby Martell") received much attention, Marley remained fully committed to establishing himself as a performer. Marley, Livingston and McIntosh then assembled a six-piece ska group they first named The Teenagers and then The Wailing Rudeboys before settling on The Wailing Wailers in mid-1963. Kong's questionable accounting practices ultimately brought an end to his association with the group, and so in the summer of 1963 the Wailing Wailers auditioned for Studio One owner Clement Dodd, who produced the two tracks I'm Still Waiting and It Hurts to Be Alone. Manufactured in an edition of 300, the single had a significant impact on the streetside "sound system" circuit, prompting Dodd to arrange another session soon afterward. The group member who had provided lead vocals for It Hurts To Be Alone, Junior Braithwaite, had just moved to the States with his family, and so for the next single Simmer Down the role of principal singer fell to Marley. Released on Dodd's Coxsone label just prior to Christmas, in February 1964 Simmer Down reached the top of the Jamaican charts, attracting national attention to Marley and his bandmates. In spite of a run of successful singles throughout the next two years (Rude Boy, Rudie, Jailhouse, One Love, Put It On) by the end of 1965 financial difficulties had whittled the Wailing Wailers line-up down to the core trio of Bob, Bunny and Peter. The following year Marley briefly relocated to the U.S., where his mother had recently established a home with her second husband in Delaware; after working for eight months to finance his music career, the singer moved back to Kingston to resume activity with the group -- now simply known as The Wailers. Their recordings had already been gradually evolving from "rude boy" street anthems to more socially-conscious material, but by 1967 the influence of the Rastafarian movement on Marley and his bandmates had become the central concern behind their music. The shift in Jamaican popular music from ska to rock-steady during the mid-1960s resulted in a significant drop in sales for Dodd, who had not instigated a corresponding shift in his label's output. This -- aggravated by the lack of financial compensation that had plagued the group from the beginning -- prompted the Wailers to leave Coxsone and establish their own Wail'N'Soul'M label and shop based at Marley's home in Trench Town. For each new release, the band (which now also included Marley's wife Rita) would personally bring the records around to Kingston shops; unfortunately, this approach proved much too difficult to maintain, and towards the end of 1967 a lack of resources forced the singer to dissolve the label. The single Bend Down Low b/w Mellow Mood did find it's way into the world prior to this outcome, however, and the latter track would become one of Marley's most frequently covered songs. For a short while the Wailers continued primarily as songwriters for other artists, but in 1970 the group began working with Lee "Scratch" Perry, an innovate producer who had established his own Upsetter label in 1968. Perry helped to transform their sound -- taking them farther away from the conventional vocal harmonies of their early years and bringing a more contemporary edge to the material -- and in subsequent years, their collaborations with him would come to be widely regarded as the high point of The Wailers' (and Marley's) career. Brothers Aston "Family Man" Barrett and Carlton Barrett from Perry's studio band The Upsetters were brought in to provide the rhythm section for the sessions, utilizing a style developed in the studio with Perry that had helped to define the emerging reggae genre. A large number of single tracks (My Cup, Duppy Conqueror, 400 Years, Small Axe, Soul Rebel amongst them) were recorded during this period, as well as other tracks collected on the full-length albums Soul Rebels (1970) and Soul Revolution (1971). In 1971 Bob Marley traveled to Europe with American vocalist Johnny Nash, where he successfully secured a recording contract with CBS. The next Wailer's single Reggae on Broadway (1972) had little international impact, but while promoting the single in the UK Marley was able to arrange a more lucrative deal with Island Records founder Chris Blackwell; the full-length album Catch a Fire was issued in April of 1973, at last giving the group access to a world-wide audience. Media attention to the record was considerable, and a tour of Britain and the United States (a rare occurrence for a reggae act) was quickly arranged. Bunny Wailer refused to participate in the American leg of the tour, but the remaining band -- with old mentor Joe Higgs serving as Bunny's replacement -- made an enormous impact on U.S. audiences both as headliners and as an opening act for American performers such as Bruce Springsteen and Sly and the Family Stone. The Wailer's second album for Island, Burnin', was released in October of '73 and featured what would become one of Marley's best-known tracks Get Up, Stand Up. The album also included the song I Shot the Sheriff, which was turned into an international hit via an Eric Clapton cover version the following year. Burnin' also marked the end of the original Wailer's collaboration, as the stress resulting from the band's fame would induce both Bunny Wailer and Peter Tosh to leave by the end of 1974. Marley spent most of the following year in the studio putting together his next album Natty Dread, utilizing a backing band that now included the female vocal trio The I-Threes (comprised of his wife Rita Marley, Marcia Griffiths and Judy Mowatt), guitarist Al Anderson, keyboardist Bernard Touter Harvey and percussionist Alvin Patterson in addition to the Barrett brothers rhythm section. Released in early 1975 and credited to "Bob Marley and the Wailers", Natty Dread helped to extend the singer's international reputation, eventually placing in both the US and UK top 100. With his next release -- a live collection documenting a performance at London's Lyceum Ballroom during the Natty Dread tour -- Marley once again positioned himself in the charts, the single release of the album's version of No Woman, No Cry even reaching the UK top 40. His popularity made another leap forward after his second post-Wailer's studio effort Rastaman Vibration broke the US top 10 in 1976, confirming the singer as the most visible practitioner of reggae and Rastafarian beliefs in the world. This status carried negative consequences as well, however, and in early December, on the evening before a politically-charged free concert event in Kingston, an unsuccessful attempt was made to assassinate Marley; the attack left the singer and his wife Rita with minor gunshot wounds, while manager Don Taylor and friend Lewis Griffith were seriously injured. Marley still participated in the concert the following day, but left the country for the UK immediately afterward. During his 18-month exile in London, Marley recorded the albums Exodus (1977) and Kaya (1978), both of which were given enthusiastic receptions in the UK. Three singles from the first release (Exodus Waiting in Vain and Jammin) and two from the second (Satisfy My Soul and Is This Love) maintained the singer's presence in the charts throughout the final years of the 1970s, while Jammin provided him with his first British top 10 hit. Response in the States was not quite as strong due to the reluctance of commercial radio stations to include reggae as part of their programming, but the singles still managed to find their way into the U.S. R&B charts. In April of 1978 Marley returned to his home in Jamaica and participated in the "One Love Peace Concert", organized to encourage the end of violence between the country's two principal political parties. Later in the year he would be invited to New York to receive the Medal of Peace in recognition of his efforts. At the end of 1978 Marley made his first trip to the African continent, culminating in a visit to Ethiopia, a focus point of Rastafarian belief. Babylon By Bus -- a live collection recorded during his band's European tour earlier in the year -- was issued in November, once again doing far better in Britain than in the States; this continued to be the case for the next studio album Survival (1979), which entered the UK top 20 but only reached #70 on the US mainstream charts. By this time Marley's following in Europe had grown to enormous proportions, his performances frequently having attendances numbering in the tens of thousands. In early 1980 he was invited to perform at the official ceremony celebrating the transformation of the former British colony Rhodesia into the independent state of Zimbabwe (Marley having already included a tribute to the new country on the Survival album). The summer of 1980 saw the release of Uprising, the final studio effort by Bob Marley and the Wailers. Both the album and its featured single Could You Be Loved were an immediate hit in the UK and throughout most of Europe, as well as having more of an impact in the States than his previous few efforts. An extensive European tour was launched in the second half of the year, following which a US tour was organized; after completing the first two performances at New York's Madison Square Garden, however, Marley collapsed while jogging and needed to be rushed to the hospital. 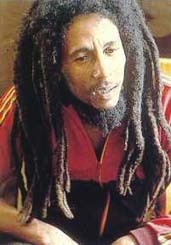 It was discovered that a cancerous growth identified in his toe in 1977 had been slowly spreading through his vital organs and was now infecting his brain (Marley had refused treatment after the initial diagnosis, since the amputation necessary to remove the growth was in conflict with his Rastafarian beliefs). A final performance was undertaken in Pittsburgh, but the advanced state of his illness forced the singer to cancel the rest of the tour; he was subsequently transported to Bavarian clinic to undergo an experimental, non-toxic treatment. A brief remission was achieved, but in May of 1981 the disease claimed the singer's life in Miami while he was traveling back to his home in Kingston.